This tapestry combines two separate scenes and depicts typical activities in the lives of nobilities. The noble man reads while the lady sits spinning. 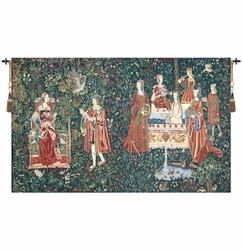 Lady in the Bath Belgian tapestry is based in the time period of Louis XII and depicts a noble lady bathing while her servants and ladies await. Product Care - Gently vacuum every 6 months. - Dry clean only- when required.